Having your carpets professionally cleaned can be scary, especially if it’s your first time. Trying to find a carpet cleaning company that can fit your schedule, that won’t take all day to clean, and won’t give you a headache is one heck of a job. Well, carpet cleaning San Antonio doesn’t have to be so hard. There are plenty of professionals that won’t give the run around and who are easy to deal with. At the top of this list is Beyer Carpet Cleaning. 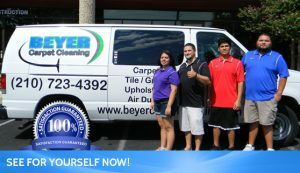 Beyer Carpet Cleaning has been in service for 2 years now and has learned what customers need to know, how to treat their customers, and how to get the job done efficiently. Calling someone to get information can be a scary experience because of terminology, jaw dropping prices, and conflict of schedule. Well, Beyer Carpet Cleaning like to over explain each situation, what they use for carpet cleaning, and what to expect when carpets are cleaned. They let you know what kind of stains can be easily taken care of and which ones cannot. They let you know that 95% of stains can be removed, how long to expect your carpets to be wet, and how long the job will take. Once you have all the carpet cleaning information scheduling an appointment is painless. They are open from 8am – 7pm for carpet cleaning services with 2 hour windows of arrival. So if you don’t get out of work until 5 or 6 pm they can schedule your carpet cleaning after you get out of work so you don’t have to worry about rushing home or leaving work early. You can save your vacation time for actual vacation. If you want your carpet cleaning done while the kids are at school, no problem they got you covered there too! Whatever the case may be Beyer Carpet Cleaning is always willing to work with a customer’s schedule so they can get carpet cleaning at a time that is most convenient for them. Also, they can usually schedule your appointment with ease if you call 48 hours in advance. Once your appointment they will show up between the time agreed upon. Although they give a 2 hour window of arrival they usually never go the full 2 hours. In most cases their technician arrives earlier, right on time, or within the first hour. If the tech will or can be earlier he will call the customer to make sure it’s ok to show up early. Not only are they efficient with their time they are also fast and efficient carpet cleaners. Upon arrival they will walk through the home with the customer examining the areas to be cleaned and will notate anything that may not come out or any carpet damage. Then the tech will begin the carpet cleaning process by putting down their prespray solution consisting of enzymes, emulsifiers, and a deodorizer. The enzymes and emulsifiers will remove the dirt and stains while the deodorizer will freshen up the carpets. After that is put down the tech will then processed to steam clean the carpet with 210+ degree water which will kill all germs, bacteria, allergens, and dust mites living within the carpets. He will also vacuum in order to extract as much water as possible and sucking up all that dirt that will come out of the carpet. When the carpet cleaning technician is done the customer will have a chance to review the work and sign off stating that the job was done to their liking. The technician will not try to push the customer to purchase any additional services. He may recommend a service due to the condition of the carpets but other then that he will not pressure the customer to purchase unnecessary services or products. 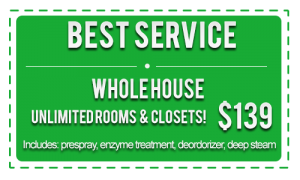 So if you are looking for the best carpet cleaning in San Antonio, a stress free environment, and fast service look no further then Beyer Carpet Cleaning. Beyer Carpet Cleaning hold themselves to a high standard of service and expects each customer to receive quality service every time. There is nothing better then top notch service when you are the one paying for that service. Skip the mess, headaches, and unreliable carpet cleaners and just call Beyer Carpet Cleaning.